Continued from Robert the Bruce: Part 2. But the key to Scotland, Stirling Castle, was still held by the English and was under siege, the attackers being commanded by Robert's brother Edward. Without Robert's knowledge, Edward made a deal with the English Constable of the castle that if an English army had not arrived to relieve the castle by 24 June 1314, the castle would surrender, so making an aggressive siege unnecessary. Robert was not happy: he was deliberately avoiding the head on confrontation with an English army his brother's deal had now made unavoidable. Edward II of England hastened north with an army of some 20,000: probably the largest English army (of many) to invade Scotland. They gathered in Berwick on 10 June 1324 and headed north. Late in the afternoon of Sunday 23 June the vanguard of the English army arrived at the ford over the Bannock Burn, a couple of miles south of Stirling. On the far side a Scottish army of some 7,000 awaited them. They attacked immediately, discovering the hard way that the Scots had placed concealed anti-cavalry spikes across much of the area: but managing to mount a personal attack on Robert, which he fought off with an axe. A second English attack was also repulsed. So began the Battle of Bannockburn. The main battle took place on 24 June 1314 and was characterised by English knights charging against Scottish schiltrons, phalanxes of spearmen. The ground underfoot between the Bannock Burn and the River Forth was boggy and ill suited to heavy cavalry and heavily armoured knights. And in the close quarters fighting the English longbowmen were reduced to shooting indiscriminately into the melee before they fled in the face of a charge by the Scottish cavalry. This left the battle finely balanced. The tide was turned when Robert's unit of Highlanders charged, and then Robert's untrained reserves emerged from behind nearby high ground to join in, making Robert's army appear much larger than it was. The English army broke and attempted to flee. Edward II only just escaped after the battle: most of the English knights did not. Robert I was at last the (fairly) unchallenged King of Scotland and although the Wars of Independence from England were not over, a corner had finally been turned. Amongst the English captives was the Earl of Hereford, who Robert exchanged for his wife, sister and daughter. Robert went on to open a second front against the English in Ireland, under the command of his brother Edward, who became High King of Ireland in 1316, before being killed in 1318. Also in 1318 the Scots completed their reconquest of their own land by capturing Berwick-upon-Tweed and repeatedly raided the north of England in an effort to force Edward II to recognised Scotland's independence. On 6 April 1320 the Scots agreed the Declaration of Arbroath a letter to Pope John XXII, intended to persuade him to recognise Robert as the King of an independent Scotland, and to put pressure on England to do so as well. The Declaration of Arbroath was drafted by the Abbot of Arbroath and is one of the most important documents ever written, being the first ever declaration of independence by any nation, and containing remarkably advanced ideas in the areas of nationhood and kingship: arguably providing some of the intellectual background to the later American and French Revolutions. This was partially successful. The Pope arranged a truce and peace talks with England in 1321. These broke down, and the Scots resumed their raids into northern England, and on 14 October 1322 won an important but little know victory at the Battle of Byland. In 1324 the Pope formally accepted Robert as King of Scotland. Edward II of England was replaced by Edward III after being deposed (and probably murdered) by his wife. Cross border raids conflict continued, though the English withdrew from hostilities after Edward III was nearly captured by a Scottish raiding party in Yorkshire. In late 1327 peace talks again resumed. These concluded with the Treaty of Edinburgh and Northampton signed by Richard I on 17 March 1328 at the Palace of Holyroodhouse and Edward III on 3 May 1328 in Northampton. Edward renounced all claims to English superiority over Scotland, and promised the return of the Stone of Destiny removed in 1296 (this promise was not delivered on for nearly 700 more years). In return Scotland paid England 20,000 marks compensation for damage caused by raids into northern England. It also provided for the marriage between Robert's four year old son David (born to his wife 10 years after her release from English captivity) and Edward III's sister Joan. Robert the Bruce did not attend his son's wedding in July 1328. 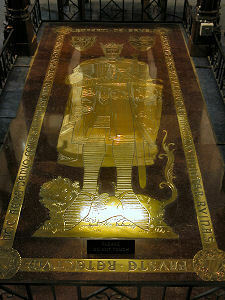 He was probably already ill, and died on 7 June 1329 at Dumbarton, to be succeeded by his young son, David II. Robert's excommunication had been removed by the Pope in October 1328, and Robert died knowing he had achieved everything he had set out to achieve. Scotland was once more an independent sovereign state. Well, not quite everything: he had never had the time to go on crusade. 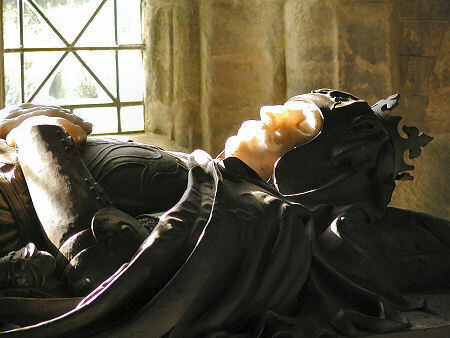 So while Robert I was buried in Dunfermline Abbey, his heart was placed in a silver casket and carried by Sir James Douglas when he fought against the Moors in Spain. Sir James was killed, but Robert's heart was returned to be buried in Melrose Abbey. 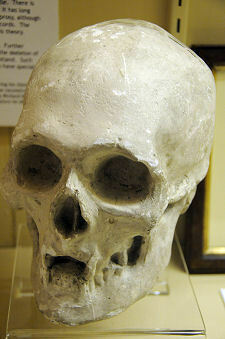 A skull though to belong to Robert was found during building work in Dunfermline Abbey in 1818. A cast of it is today on display in Dumfries Museum.